The experts at Badgerland Exteriors can install quality gutters that will provide effective roof drainage year round! Contact us today to get a free estimate on new or replacement gutters and downspouts throughout the South Central Wisconsin area! Because older gutters & downspouts can be difficult and costly to repair, many homeowners elect to replace old with new. Gutter and downspout choices are more varied today than ever before. The major decisions are explained below. Materials. Historically, gutters have been made from many different materials, including wood, steel, and seamless aluminum gutters. Aluminum gutters are most popular today because of their affordability, durability and color variety. However, some historic homes may deserve steel or even wood gutters to maintain their authentic appearance. Color. If you want gutters in a color that matches your house, aluminum is your best choice. Most gutter specialists have access to aluminum gutter stock that can be ordered with factory-applied finishes of different hues. Style. Different gutter “profiles” are available. Aluminum gutters are often formed in a “K” profile that includes a flat back section and a curved front. Half-round gutters can sometimes be found on older houses. Size. K-style gutters come in 5-in. and 6-in. sizes. The larger size is usually specified when the roof area being drained is especially large and/or steep. 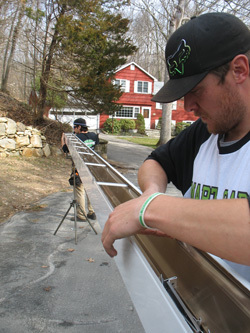 An experienced gutter installer will be able to determine which size is best for your house. Gutter guards. This popular gutter add-on prevents gutters from clogging and overflowing – a smart addition to any gutter installation. Additional drainage options. 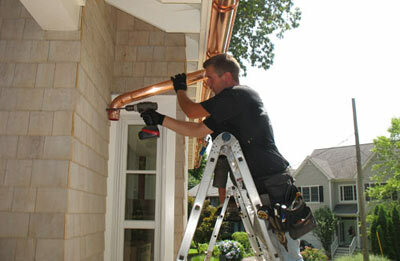 Downspout extensions are sometimes necessary to carry roof runoff away from the house. Many of these simply extend out over the yard or garden, while others consist of buried pipe that drains to a dry well or daylight outlet. Even if you have a trusted, favorite general remodeling contractor, it’s best to have your gutters installed by a gutter specialist or a roofing contractor who also installs gutters. Because these specialty contractors install gutters every day, they draw on extensive knowledge and installation experience. They can spot related problems such as damaged flashing or rotted fascia boards that require replacement or damaged flashing. 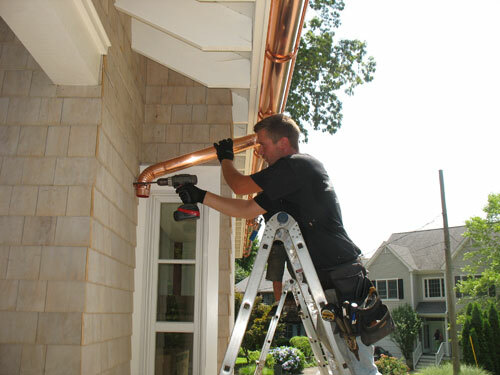 A gutter and downspout specialist will usually get your job done quickly and economically. In addition to gutter and downspout installation, we also offer gutter guards installation to keep your gutter system performing like it should. Contact the roofing and gutter experts at Badgerland Exteriors by calling 1-855-569-9767 or fill out the online form for a free inspection and estimate!